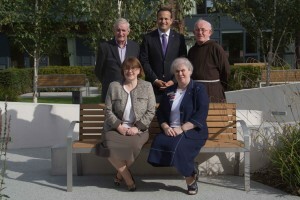 Minister Varadkar with (front l. to r.): Medical Director Regina McQuillan, Director of Nursing Sr Patricia Walsh; (back:) Fr Eugene Kennedy, Fr Dan Joe O’Mahony. Dublin West TD and Minister for Health Leo Varadkar has said he is delighted that the first beds have now opened at St Francis Hospice in Blanchardstown this week. “This is a fantastic day for St Francis Hospice, for the local community and for the huge number of volunteers. The first full-time patients have moved in this week and more will follow in the near future. I really want to commend the volunteers who have built this excellent facility. The support from the community has been outstanding. I also want to commend the Daughters of Charity, Fr Eugene Kennedy of Laurel Lodge, and Fr Dan Joe O’Mahony of the Oratory,” Minister Varadkar said. The Hospice has been providing day care and home care for some time but is now able to provide full-time in-patient care thanks to the provision of €1 million in the 2014 HSE Service Plan. It will initially provide full-time care to 12 patients. When fully open it will have 24 full-time beds, 22 nurses and a permanent medic. The Hospice was built on land granted by the Government, but the construction costs were mainly covered by money raised locally. By this stage, almost everyone in the constituency has attended a fundraiser for the hospice or contributed in some way.